I grew up in Fort Wayne, Indiana. My interest in drawing began in the second grade at Justin M. Study school. First I traced pictures of my favorite cartoon characters from the coloring books I had to occupy my time during lunch break. Eventually I began drawing the characters from memory. A story I wrote and drew in Miss Inoye's third grade class was recognized by a local newspaper and carried the headline “A Dr. Seuss Success”. That was all the encouragement I needed to continue drawing. 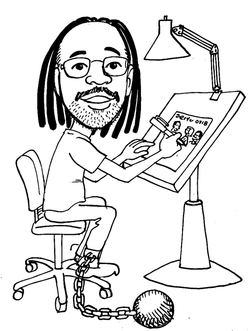 In the seventh grade my mother introduced me to Richard Green, an African American cartoonist who was the brother of her high school friend. Richard who was known by his pen name “Grass Green” was a contributor to the comic fanzines of the early 60's (Alter Ego, Star Studded, and others). Grass did cartooning for a local black owned weekly newspaper, Frost Illustrated, and was also doing work for Charlton comics. I was very impressed and I decided then that I would work towards becoming a professional artist. I improved enough for him to give me my first job inking his pencils for his Frost Illustrated comic strips. Fast forward to today and countless storyboards, magazine illustrations, comics and other art I have produced for a long list of companies like Marvel, BET, FCB, O&M, Warner Music Group, JWT and Leo Burnett. My experience, quickness and versatility has helped me through the years and I'm always up for a new challenge. I'm easy going. No Prima Donna stuff here. Give me a call and let's discuss your next job.